Vintage Bookshelves Bookends in composite material finish. Cast irons 4.75 inch tall DUCK door stop or decorative display. COACH LOGO kindle storage case, zipped on the side. Large metal golf ball bookends from India in bronze color finish. Blekco Handcraft Bear Bookend, dark amber glass. Zeus bookends from LEGO, Japan. GALLEON M-M Co. ship bookend in cast iron. Abstract Rooster door stop in cast iron, TMT 2000. Vintage crystal Elephants bookend, paperweight. Moroccan style two bookends with bedazzled decoration in rich gold tone. Antique cast Iron Sailing Ships bronze color bookends in set of two. 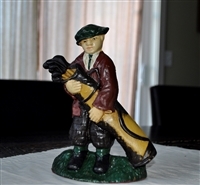 Woman golfer vintage door stop in cast iron. Cast Iron Rooster door stop, vintage decor. Porcelain cats vintage Japanese bookends set. Ph Gonner Sparrows plaster vintage Bookends set. Cast Iron Caddy, golfer door stop. Cast Iron Bear Mama with a jar of honey doorstop in colorful finish. Scottish Terrier iron door stop. Unique bookends in Educational Teacher School theme, composite in set of two. Blooming Roses bouquet cast iron door stopper.